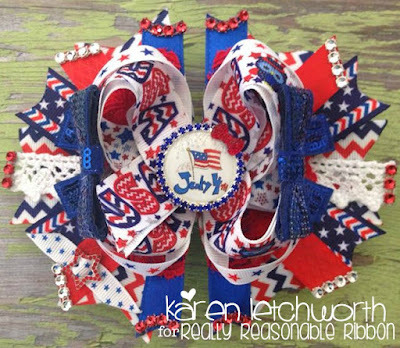 Really Reasonable Ribbon makes it SO MUCH FUN to celebrate any holiday or special occasion with their amazing selection of ribbons and trims. To help celebrate the 4th of July this year, Really Reasonable Ribbon (and my friend, Rachel) helped me to create some lovely hair bows. Yes, Really Reasonable Ribbon carries much more than just the ribbons and trims - they also carry all the supplies for creating beautiful hair bows and head bands. You can see them all here in their Headbands and Clips Category. They have different sizes for every hair length and thickness so that it's perfect for all hair types from infants to old ladies (like me....LOL). 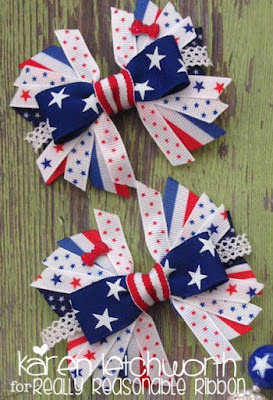 These smaller bows include several ribbons that were included in the May Ribbon Club, including the Tiny Stars on Electric Blue Grosgrain, Tiny Poppy Red Stars on White Grosgrain, Tiny Electric Blue Stars on White Grosgrain, 5/8" Red White and Blue Striped Grosgrain and Paulette White Crochet Lace. This larger bow includes the Molly White Crochet Lace, Tiny Electric Blue Stars on White Grosgrain, Red With Satin Grosgrain Edge, Electric Blue Satin, and several other scraps of this and that. Really Reasonable Ribbon not only has a wonderful Patriotic Selection, but they carry selections for pretty much any special occasion you can image. You will never have to look anywhere else for your ribbon needs! Thanks for stopping by today, and don't forget to check the Really Reasonable Ribbon Blog each day for inspiration, and also for the fun challenges we run each month. We love it when you visit us! Beautiful bows. Love the ribbon. This is so fun, Karen. I have let my hair grow out the past two years and it's finally in a place where I wear pony tails. I wonder if I'm a bit too old for these? I'm tempted to try it anyway! Such fun, patriotic pieces. Love them! Oh My Goodness Karen you have been so inspired and so busy - what wonderful projects.